For bonding of solid and engineered flooring to strong, sound dry substrates. High strength. 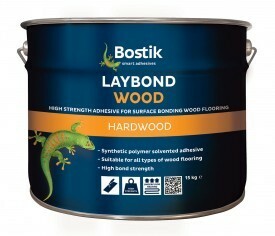 Bonds all woods including parquet, wood block and wood strip. Suitable for use with warm water underfloor heating systems. Approximate Coverage: Wood Strip/Wood Plank: up to a max of 16m2 per 10L using a B2 notched trowel. Wood Block/Parquet Panels: 25m2 per 10L using a trowel notch of 2mm x 6mm. A filled solution of synthetic polymer resins in a blend of solvents. Formulated to trowel consistency.